Starring Penélope Cruz, Javier Bardem, Ricardo Darin, Eduard Fernandez, Barbara Lennie, Inma Cuesta, Elvira Minguez, Ramon Barea, Carla Campra, Ivan Chavera, Sara Salamo, Roger Casamajor, Jose Angel Egido, Sergio Castellanos, Jaime Lorente, Elvira Mínguez, Chema Adeva, Jordi Bosch, Stephanie Espil, Paco Pastor Gómez, Marianella Rojas, Paqui Horcajo, Vicente Vergara, Esteban Ciudad, Pedro Nistal and Mar del Corral. Distributed by Focus Features. 132 minutes. Rated R.
Talk about weddings gone wrong. 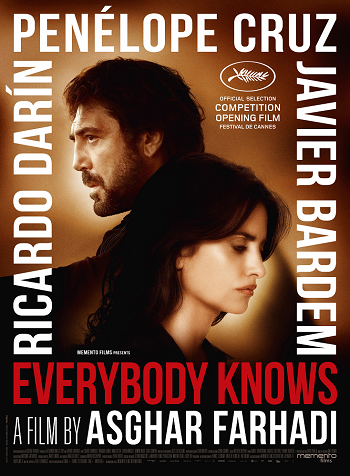 Everybody Knows starts out with families and friends gathering in a small town outside of Madrid to celebrate the nuptials of a local couple, but the celebration is short-lived as a horrific crime occurs during the reception. This leads to anger, recrimination, long-buried passions and grudges, and the desperate attempt to save a young girl. This is the latest film by Iranian director Asghar Farhadi (The Salesman, A Separation, About Elly). In many ways, the tense, talkative, labyrinthine narrative is indicative of his work, and yet at the same time Everybody Knows is a very different beast. Part of that may have to do with setting – this is Farhadi’s first film in Spain, with all Spanish dialogue. Also, as odd as this may be to say, it is probably more of a commercial film than Farhadi has done previously. First of all, this is the first time he has worked with name Hollywood stars. Married Oscar-winners Penélope Cruz and Javier Bardem are certainly the biggest names in this talented ensemble, but other cast members are also known in Spain. Farhadi also shows an uncharacteristic light touch during the early going, the wedding scenes particularly feel almost giddy for the very serious filmmaker. However, this light touch is short lived. Late in the reception, a young girl is kidnapped, and the desperate search for her opens up long-buried rifts. These mostly center around Laura (Cruz) and Paco (Bardem), former young lovers who have long moved on and married other people – Laura has also moved to Argentina and is returning home for the first time in years – but there is still a bit of a spark there. They are the center of the hurricane, but the storm – figurative and literal – drenches most of the family and the town. This is probably one of the more action-oriented films that Farhadi has done. Which is not to say that it is action-packed, most of the plot is slow and deliberative. Even as things get very dark, some of the story takes on a bit of a soap-opera tone. In many ways, the crime story is only of secondary importance to the seething emotions it exposes. In fact, when the culprits are eventually exposed late in the film, it almost seems like a random afterthought – like they needed to plug someone in to be the bad guys and this was who they settled upon. However, Everybody Knows is not trying to be a whodunit. It is more interested in why it was done, and how what was done affects a community of people. It’s probably not Farhadi’s finest work, but as all of his films, it is an intriguing and devastating look into human frailty and the heart of darkness. Copyright ©2018 PopEntertainment.com. All rights reserved. Posted: October 20, 2018. Tags: Asghar Farhadi, Barbara Lennie, Carla Campra, Chema Adeva, Eduard Fernandez, Elvira Minguez, Esteban Ciudad, Inma Cuesta, Ivan Chavera, Jaime Lorente, Javier Bardem, Jay S. Jacobs, Jordi Bosch, Jose Angel Egido, Mar del Corral, Marianella Rojas, movie review, Paco Pastor Gómez, Paqui Horcajo, Pedro Nistal, Penélope Cruz, PFF27, philadelphia film festival, PopEntertainment.com, Ramon Barea, Ricardo Darín, Roger Casamajor, Sara Salamo, Sergio Castellanos, Stephanie Espil, Vicente Vergara. Bookmark the permalink. Previous post ← Melissa McCarthy Shows Another Side of Her Talents with Can You Ever Forgive Me?